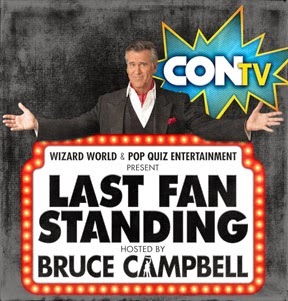 The forthcoming digital streaming service CONtv has announced it will be kicking off production for a new original series, “LAST FAN STANDING,” a game show hosted and produced by fan-favorite actor Bruce Campbell (The Evil Dead, Army Of Darkness). Created in partnership with Pop Quiz Entertainment, the series will be filmed live on the ground at Wizard World Comic Con conventions nationwide with the first show taping on Saturday, January 10 at New Orleans Comic Con. “LAST FAN STANDING”engages event attendees through a proprietary audience response system, where all patrons play along, competing for cash and prizes. The show culminates with the top four players vying for the coveted title as Campbell hunts for the “LAST FAN STANDING.” ? Wonder how much Thor's hammer weighs? Or how much damage the Vorpal blade would inflict on a 5th-Level Cleric? Fans finally find vindication in their hours studying comics, films, movies and more with host and horror icon Campbell in this outrageous new quiz show. A collaboration between his own production entity and Pop Quiz Entertainment, this will be Campbell’s first digital series. “The audience went crazy for ‘LAST FAN STANDING’ when we debuted the game at Chicago Comic Con this summer! CONtv is the perfect place to reach true fans, and we can't wait to challenge our audiences to find out who is the ultimate pop culture guru,” said Campbell.